Honda is known for their economy cars and hatchbacks. But the second production car they ever built was a sports car, the 1963 S500. The S800 was introduced two generations later in 1966. It wouldn’t have a successor until 1999’s S2000. The S800 was produced as a coupe and convertible and its targeted competitors included the likes of the Austin-Healey Sprite and MG Midget. It’s basically Japan’s first take on the classic English roadster. Take that Mazda Miata. The engine here is a 791cc straight-four making 78 horsepower. And it revs to almost nine grand, so it’s going to sound awesome with the top down. Only 11,536 examples of the S800 were built between 1966 and 1970. The current owner acquired this example in the early 1990s and had it restored. The bright yellow paint looks great and the styling on this cars continues to improve with age. With less than 20,000 miles since the restoration, it’s still relatively fresh and ready to rev. It should bring between $24,000-$30,000. Click here for more info and here for more from this sale. 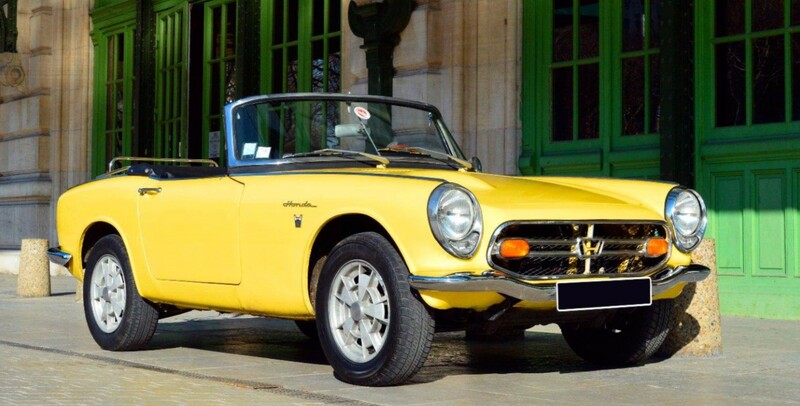 This entry was posted in Uncategorized and tagged 1968, aguttes, auctions, cabriolet, cars, classic cars, honda, s800 by classiccarweekly. Bookmark the permalink.